Some vegetables are a hit or miss. Brussels Sprouts being one of them, it depends on how you make it. 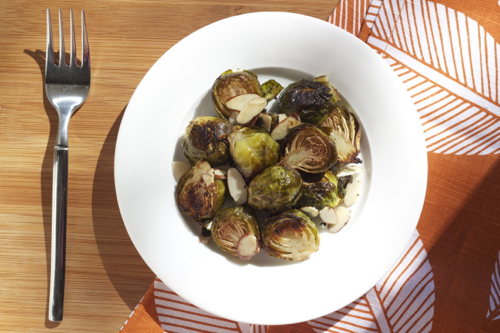 After you try these Roasted Brussels Sprouts with Almonds, you’ll wonder why you never had the chance to try them before! “Eat your brussels sprouts!” The famous line we all heard in movies growing up and the look of a young child with a disgusted face. That was my brussels sprouts connotation all my life! It wasn’t until then, when I became older and discovered the amazing world of roasting! I can’t express how much better vegetables taste once they are roasted! The flavors come to life, crispy on the outside and soft on the inside, roasting gives so much character! 2. 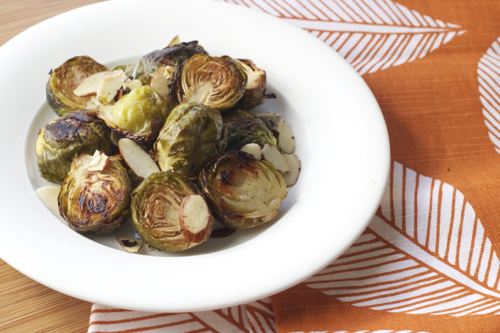 In a large bowl, combine the brussel sprouts, salt, pepper, garlic powder, olive oil and lemon juice. 3. Place the marinated brussels sprouts on a foil lined baking sheet. 4. Roast for 30 minutes, add the almonds and bake an additional 3 more minutes.